Brown Mountain Lights, The - reported as far back as 1200 by the Cherokee, recorded in 1771 by a German engineer, investigated twice by the US Geological Survey, these lights are one of the most famous of North Carolina legends. 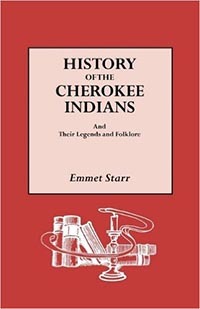 Cherokee Legends - Retold by Eastern Ban of Cherokee Indian children. Cherokee Stories and Legends - This host invites you to explore the history of the Cherokee Indian through legends and stories. Cycle of the Seasons - In Cherokee Mythology each season was a time for specific rituals and ceremonies. Dance of the Blue Blanket - Nadia was four years old...and she loved Indians. Everything about Indians excited her. One day Nadia's grandmother came for a visit. Grandmother recalled those old stories the family told of Cherokee blood. So Grandmother decided to take Nadia, along with Nadia's mother and baby brother, to her first pow wow. How the Milky Way Came to Be - Long ago when the world was young, there were not many stars in the sky. In those days the people depended on corn for their food. How the Red Bird Got His Color - Gv li loved to tease wa ya. One day gv li teased wa ya so much that wa ya became very angry. Wa ya began to chase gv li through the woods. Gv li, being the clever animal that he is, kept ahead of wa ya. Legend of the Cedar Tree - A long time ago when the Cherokee people were new upon the earth, they thought that life would be much better if there was never any night. They beseeched the Ouga (Creator) that it might be day all the time and that there would be no darkness. Legend of the Cherokee Rose - When the Trail of Tears started in 1838, the mothers of the Cherokee were grieving and crying so much . . . The First Strawberries - In the beginning of the world, ga lv la di e hi created First Man and First Woman. Together they built a lodge at the edge of a dense forest. They were very happy together; but like all humans do at times, they began to argue. Rock House: Why the Sun Follows the Moon - This story was collected in Yuba County by Don May, a Cherokee and told to Barbara Warren in 1990. Don originally heard the story in 1980 from his eighty year old Southern Maidu friend, Frazier Edwards. Why Rabbit Has a Short Tail - Back when the world was young, Rabbit had a very long bushy tail. In fact, his tail was longer and bushier than Fox's tail. Rabbit was very proud of his tail and he was constantly telling all the other animals about how beautiful his tail was. One day Fox became so tired of hearing Rabbit brag about his tail that he decided to put an end to Rabbit's boasting once and for all.